Adding a pressure-treated wooden deck to your home doesn’t just improve the look of your yard and give you somewhere to hang out and barbecue when the weather is nice. It can also add up to $9,000 to the value of your home. While you can hire someone to do the work for you, building a deck yourself can be a satisfying and money-saving experience. Here are five tips to help improve your deck-building experience. Choosing the right wood for your deck is more important than you might think. The idea behind building a deck is that you’ll have something you can enjoy for years to come — and that’s not possible if you don’t pick the right material. You can choose composite or PVC planks for your project, but they don’t look as nice or add as much value as a hardwood deck. When it comes to materials, you have some options. Pressure-treated hardwood is available at most hardware stores and gives you more options for color because it takes stain very well. On the downside, it can warp over time and damage unprotected metal fasteners. Cedar and redwood are naturally weather- and insect-resistant and are relatively easy to work with. Your color choices are relatively limited, and you’ll need to get them waterproofed and resealed regularly, but your result will be a beautiful deck you can enjoy for decades. Your final option is tropical hardwood. You might not be able to find it locally, but the wood is naturally rot- and insect-resistant. However, it’s much harder to cut and shape though and dulls cutting blades quickly. Designing your new deck is an important step, but you don’t want to start cutting based on a blueprint. Before you break out the saws, lay out your design in its final location with string so you have a visualization of its size and how much space it will take up. If your deck runs into trees or interferes with the layout of your yard, you’ll probably need to rethink your design or remove these trees. It is possible to build your deck around the trees, but that requires some careful planning and skillful cutting to achieve. The last thing you want when enjoying your new deck space is splinters in your feet from the unfinished wood surface. Do yourself a favor and invest in an orbital sander. These tools spin sandpaper or other abrasives at high speed to create a smooth and comfortable finish. If you’ve got an air compressor, you can opt for a pneumatic orbital sander. If not, you don’t need to go out and buy an air compressor — there are electric options available as well. 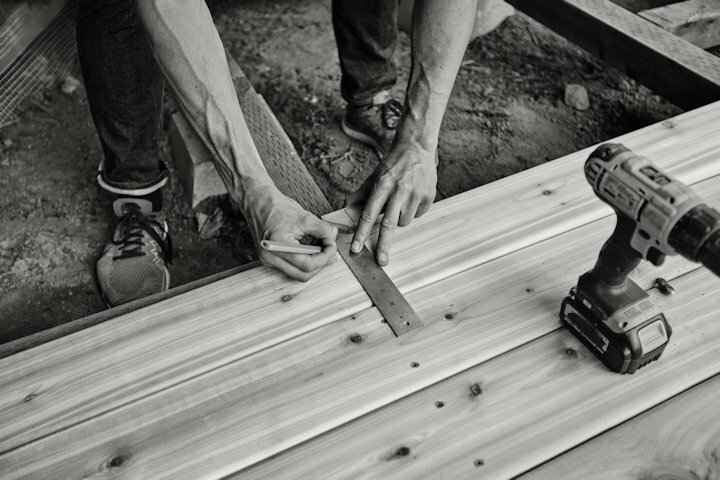 Building a deck isn’t like assembling a roof or putting together a log cabin. You don’t want the planks to mesh perfectly with one another. If you don’t have enough space between the decking, it will retain water and encourage algae growth. Too much algae on the deck surface will make it slippery and dangerous to traverse. Deck board spacers make it easier to correctly space your planks so water can flow between them, but not so far apart that you lose your phone or get caught in them. Don’t forget the last step of deck-building — protecting your investment. Choose a stain or waterproofing treatment that will protect the wood you chose throughout the year. You will need to maintain and redo the waterproofing regularly, but you shouldn’t need to do so more than once a year, depending on local weather conditions. The most important tip we can offer you is this: Take your time. Building a deck is an enormous project, and if you rush through it, it’s easy to make a big mistake that could cost you both time and money. Slow down, and don’t rush. When you finish your project, you’ll have something you can enjoy for years to come.